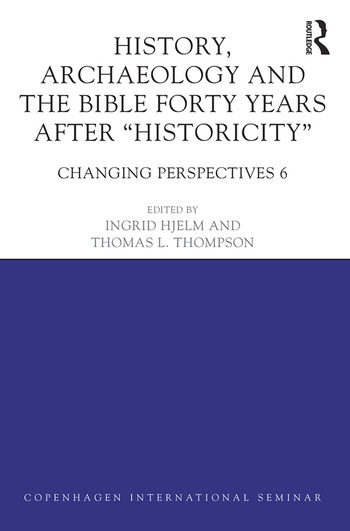 In History, Archaeology and the Bible Forty Years after "Historicity", Hjelm and Thompson argue that a ‘crisis’ broke in the 1970s, when several new studies of biblical history and archaeology were published, questioning the historical-critical method of biblical scholarship. The crisis formed the discourse of the Copenhagen school’s challenge of standing positions, which—together with new achievements in archaeological research—demand that the regional history of ancient Israel, Judaea and Palestine be reconsidered in all its detail. This volume examines the major changes that have taken place within the field of Old Testament studies since the ground breaking works of Thomas Thompson and John van Seters in 1974 and 1975 (both republished in 2014). The book is divided in three sections: changing perspectives in biblical studies, history and cult, and ideology and history, presenting new articles from some of the field’s best scholars with comprehensive discussion of historical, archaeological, anthropological, cultural and literary approaches to the Hebrew Bible and Palestine’s history. The essays question: "How does biblical history relate to the archaeological history of Israel and Palestine?" and "Can we view the history of the region independently of a biblical perspective?" by looking at the problem from alternative angles and questioning long-held interpretations. Unafraid to break new ground, History, Archaeology and the Bible Forty Years after "Historicity" is a vital resource to students in the field of Biblical and East Mediterranean Studies, and anyone with an interest in the archaeology, history and religious development in Palestine and the ancient Near East. 12 The Bible in the Service of Zionism: "We do not believe in God, but he nonetheless promised us Palestine"
Ingrid Hjelm is Associate Professor at the University of Copenhagen and Director of the Palestine History and Heritage Project. She is the author of The Samaritans and Early Judaism (2000) and Jerusalem’s Rise to Sovereignty (2004) in addition to a considerable number of articles within the field of Samaritan studies, the history of ancient Israel and the Hebrew Bible. Her latest book, co-edited with Anne Katrine de Hemmer Gudme is Myths of Exile (2015). Thomas L. Thompson is Professor Emeritus at the University of Copenhagen and author of some 130 articles and ca. 20 books, including The Historicity of the Patriarchal Narratives (1974), The Early History of the Israelite People (1992), The Bible in History: How Writers Create a Past (1999) and Biblical Narrative and Palestine’s History (2013), currently working as Project Developer on the Palestine History and Heritage Project.